What does one do when cooped up in the apartment due to incessant rain and insufferable humidity? Pay the bills? Tackle mountains of belated paperwork? Catch up on unread books? Commit to studying the local language? 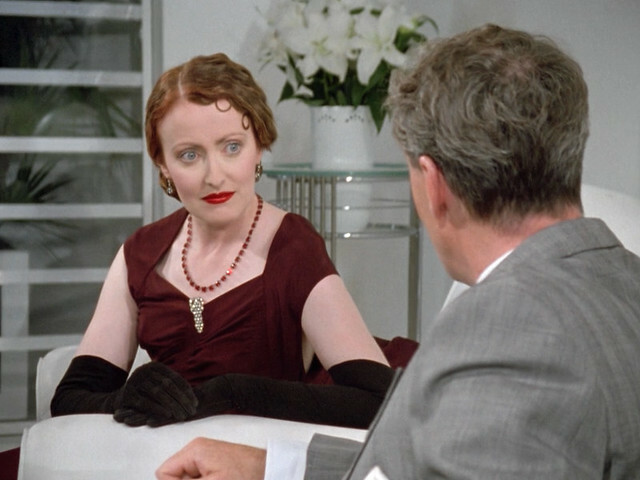 No, one watches endless hours of Poirot episodes. 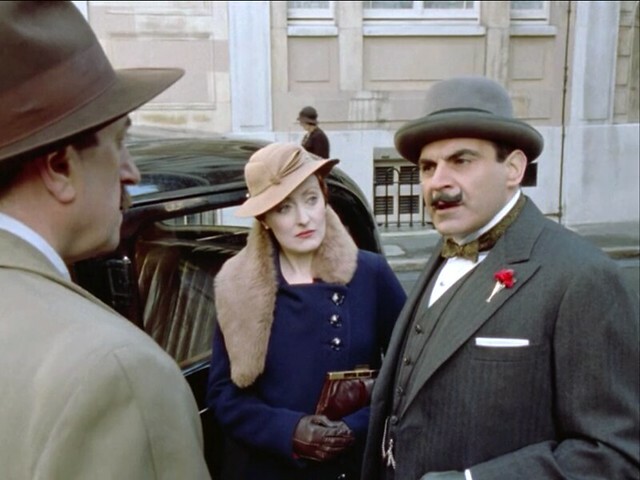 In the last couple of weeks, I have managed to plough through the first six seasons of the endearing British crime series starring David Suchet as Agatha Christie's ingenious lil' Belgian detective with the iconic moustache. That amounts to approximately forty-five hours of television consumption in mere days! Appalling! :::lowers head in self-disappointment::: However, I suppose my time wasn't entirely wasted in the process, as my pathological attention-to-detail tendencies have compelled me to take note of the esteemed fashions featured in the show - so much so that I have compiled a rather extensive set of screencaps totaling over 150 images... Not quite sure of how to present them to you in blog post format, I figured I'd start with the character of Ms. 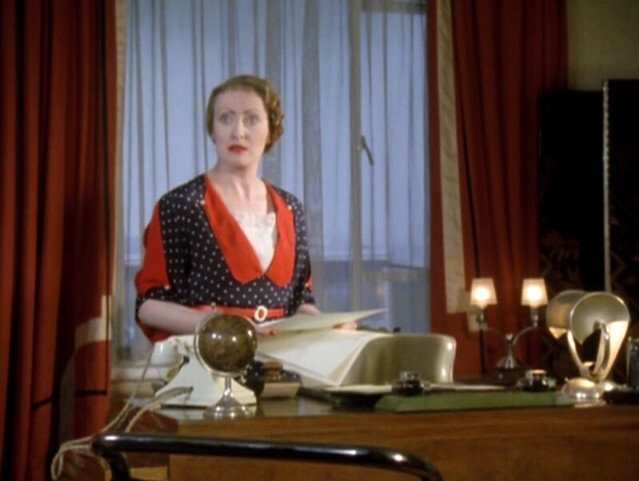 Lemon, Poirot's hard-working secretary whose diligence and perfectionism match his own. 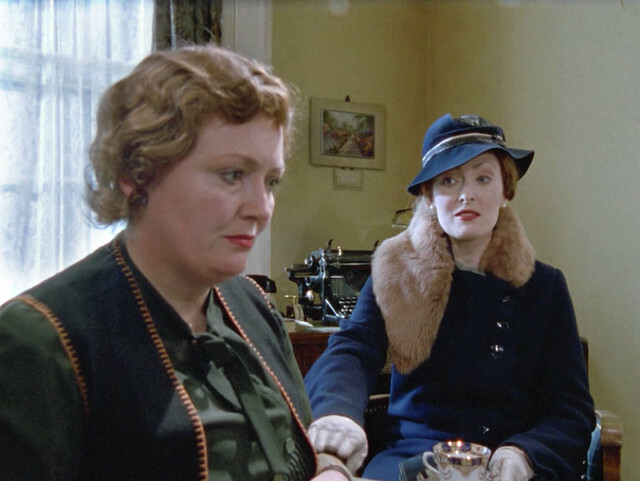 Having never read the Agatha Christie novels, I confess to knowing nothing more about the characters and their backgrounds other than what was conveyed through the television show (of which I was told stayed pretty well in-lined with the original cases). From mere deduction, Ms. 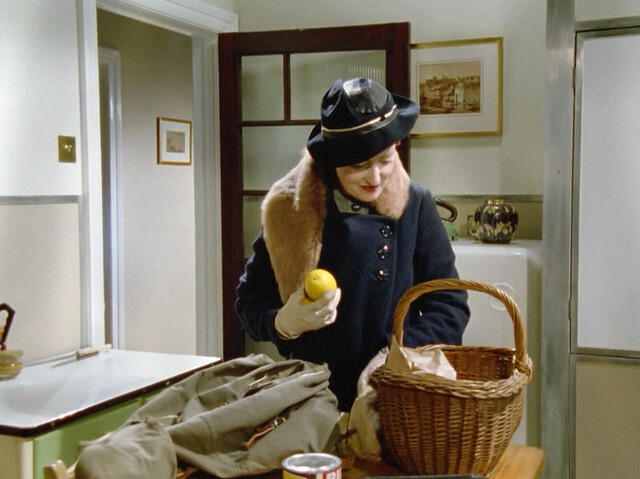 Lemon seemed to have worked for Poirot from sometime toward the end of WWI through the mid-1940s. 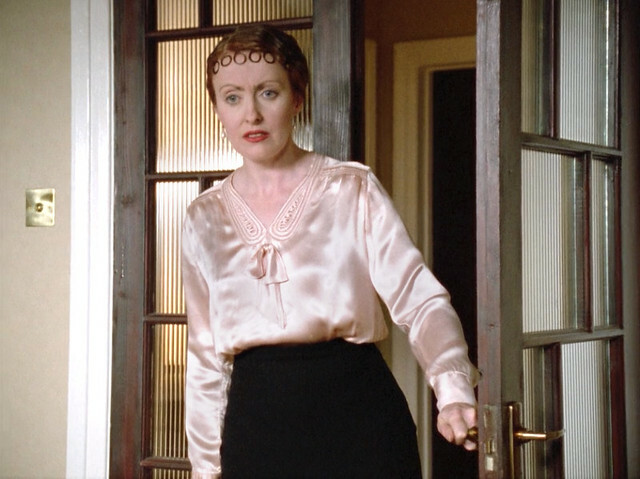 The character in the ITV series was portrayed by Pauline Moran, who appeared in 8 seasons, 31 episodes from 1989 - 2001. 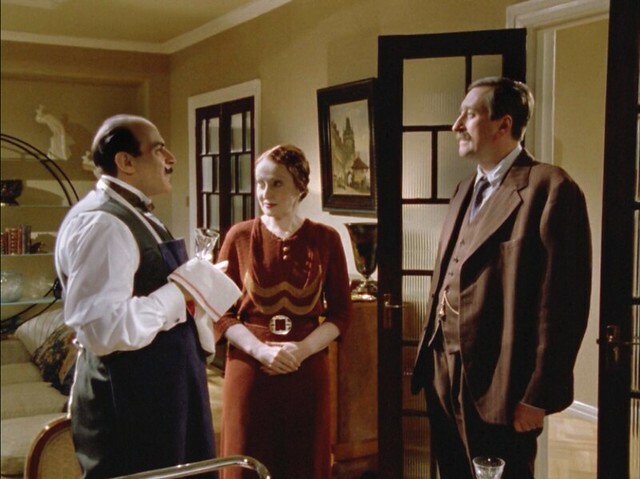 The series is still in production, and is set to film its 13th (and final) season this year, after which all the Poirot novels would have been completely adapted for screen (that is, with the exception of one short story, The Lemesuirer Inheritance). The bulk of episodes that I watched in which Ms. Lemon was featured seemed to have taken place sometime in the 1920s-30s. Art Deco influences could be seen in just about everything from that period, with the design aesthetic spanning from architecture to interior design to fashion and jewelry, etc. Keeping with her fastidious character, Ms. Lemon embodied "secretarial chic" by appearing in stylish but appropriately subdued dresses, low heeled shoes, and understated jewelry. While not always "fashionable," she made certain to appear well-groomed and "put-together." 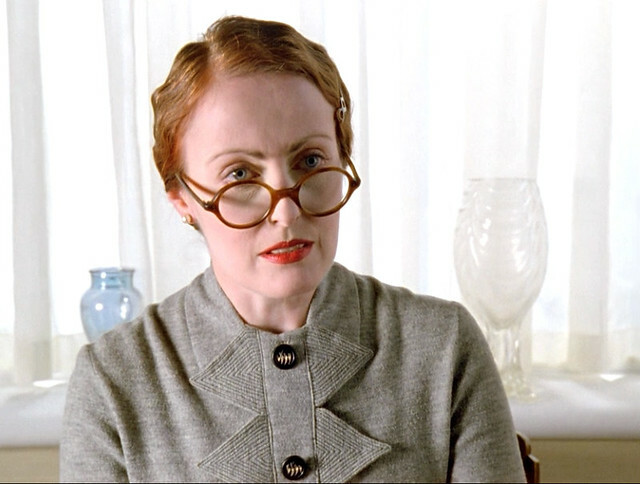 She also wore tortoise shell eyeglasses and set her auburn hair in the popular "finger waves" style of that era. The length of her hair varied but when it was longer, she would pull it into a tight bun (sometimes two smaller buns) seated at the base of her neck. Never did she go with "loose" hair. Finally, her makeup was generally light and minimal, with the exception of the occasional bright red lipstick choices. The buttons and middle embellishment on the front of this gray dress is very "art deco". Ringlets or spit curls (spiral curls of hair pressed flat against the forehead, temple or cheek) were also a popular back in the 1920s. Ms. Lemon could be seen sporting them often! More art deco inspired geometric patterned blouses. 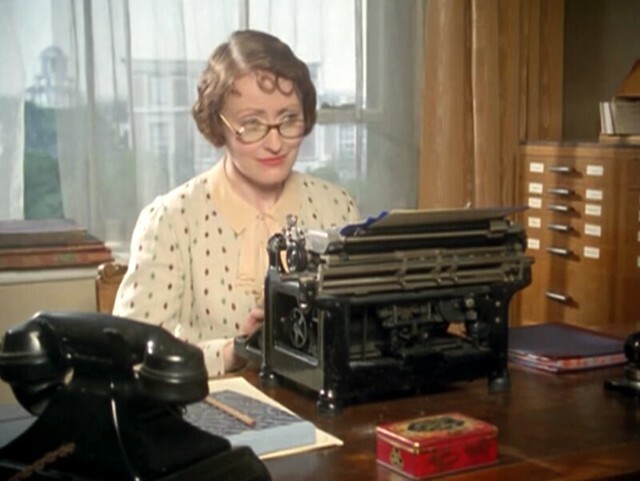 Clanking away at the old typewriter. Any guesses on the make? Probably either Underwood, Remington or Royal. oversized lapels and slits in the sleeves. Very lady-like in his soft pink blouse and black shirt. Love the unusual collar and sleeve design on this green knitted dress. Not so sure about this dress...The white adornment in the middle looks like a large snowflake...but I do like the rows horizontal slits. She was frequently seen in "rust" colored clothing. Beautiful soft pink satin jacket+skirt, paired with a cream colored hat and a rose colored lipstick. Funeral attire...(love her lipstick colour though). The detail in the collar/lapels of this burgundy wool coat adds a beautiful texture and dimension to the otherwise plain coat. Also, love her tan suede gloves. Love the white buttons at the tip of the lapels on this tailored navy coat. This navy coat with the fur collar/stole and the oversized buttons is the most glamorous of all of Ms. Lemon's coats. Really like her makeup here also. Here she is in the same coat but a different hat. The hat is most interesting! You can't see it very well but it comprises of two "layers" (of different shades) that overlap, then bound together by a thin light colored belt. 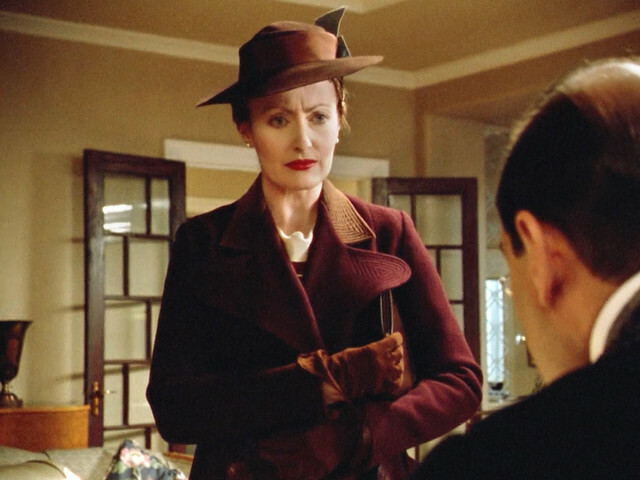 This dark red evening gown with long black gloves is the most "dressed up" Ms Lemon has ever been (at least through season 6). She looks stunning! I hope you enjoyed these! More to come soon. Lovely! 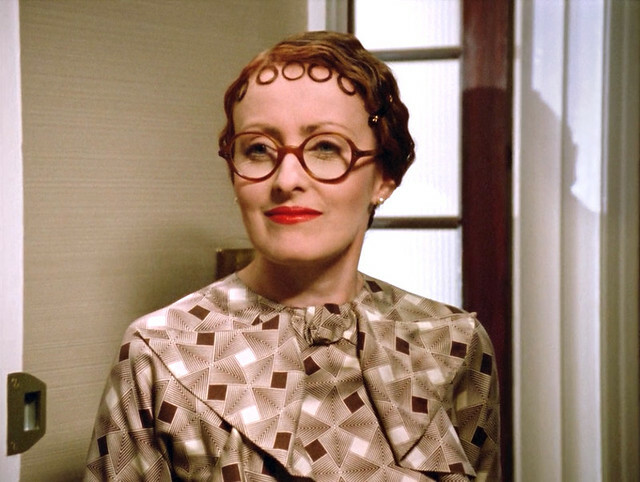 I strive for secretary chic!!!!! I love that this actress is Botox free. Way more interesting in my book. We are experiencing record heat in Reno 103 today. Maybe I need to do some serious tv watching myself! Thanks for the lovely post. 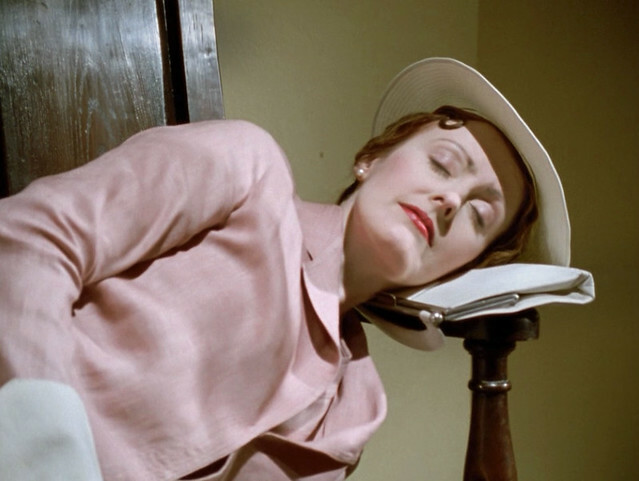 watching Poirot episodes is my favourite method of relaxing! I was so disappointed when they decided to go with a new direction in the later series which no longer feature Ms. Lemon, Hastings and Japp. 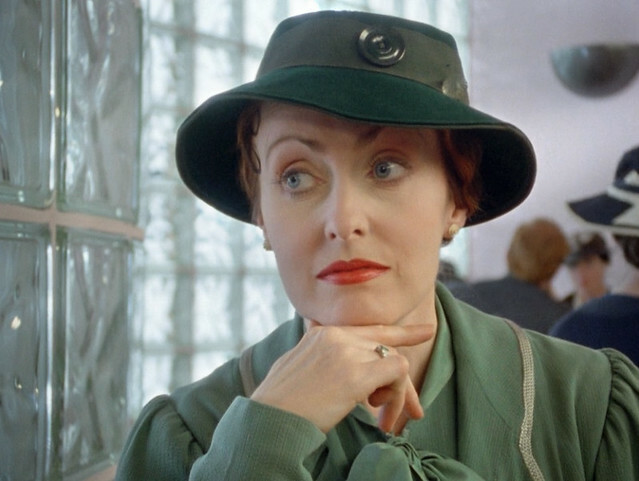 I recently got nexflix and was watching Poirot again, too. I enjoyed seeing what Ms. Lemon would wear. Glad to see I wasn't alone with that. You also should check out Tommy and Tuppence which is another Agatha Christie series which is on netflix. 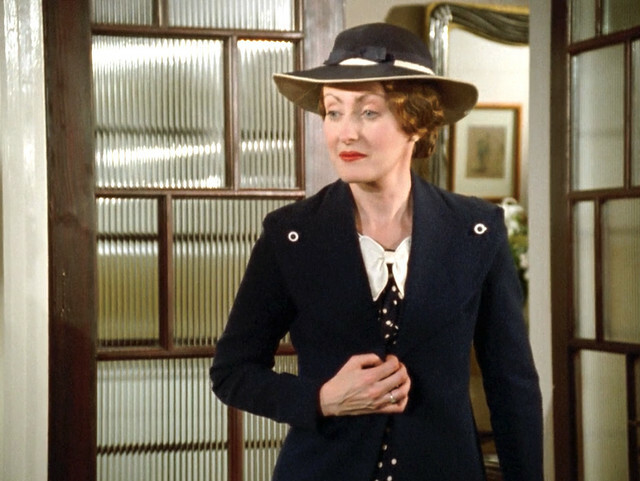 Tuppence outfits are wonderful!! @Shell - I have Tommy & Tuppence in my Netflix queue! I've watched the pilot but haven't gotten around to seeing the rest yet. I wish the quality was better though but it looks promising. Thanks for the recommendation! @coffeeaddict - I didn't understand your comment until I had gotten to Series 9, which was when they took out Ms. Lemon, Hastings, and Japp and changed the tone of the show quite dramatically. Although I enjoyed the later episodes, I definitely missed the more light-hearted, often funny moments seen in the earlier ones. 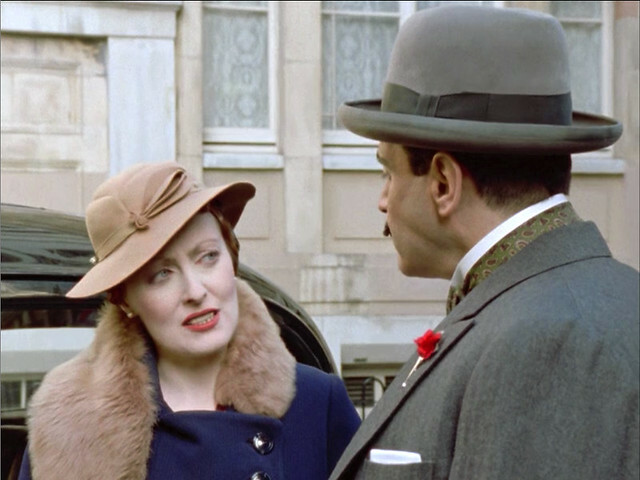 The later ones were darker and more serious and Poirot lost a lot of his more amusing character traits. @Anonymous - I definitely agree with you regarding the Botox! 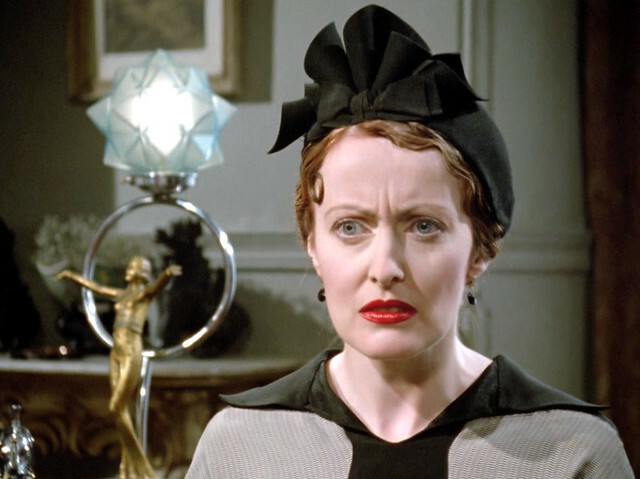 I think, in general, British/European actresses tend to get botox-ed a lot less than Hollywood ones and thank goodness for that! 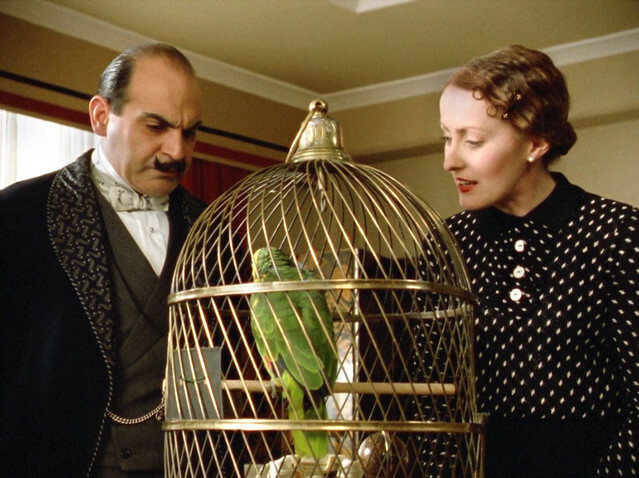 Love, love, love Poirot! I love Miss Lemon's style! I also have a little crush on CPT Hastings..I think it's the way he looks in those amazing 1930's styles! 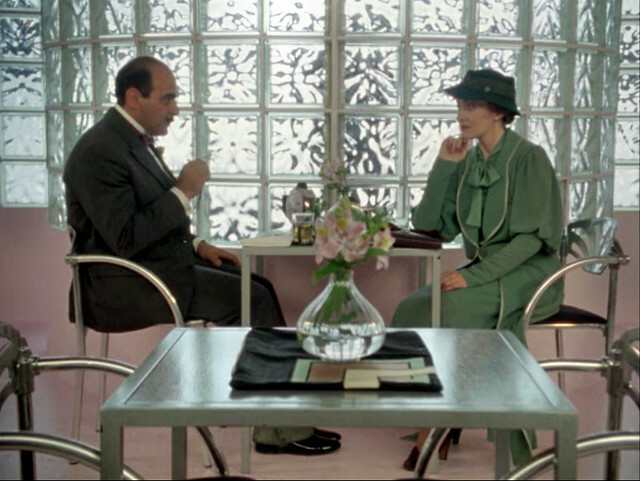 Any idea about the double arm lamp featured in the background of the one with the green dress? I have read nearly every Agatha Christie book so watching these shows is a must for me. Now I rent them on Netflix. They are done so well and the art deco styles in the clothing and the scenery always fascinates me!! thanks for compiling these great costumes to drool over! Aaaaa! All her outfits in one place, a dream come true :)(I always pay special attention to what she's wearing.) Thank you! THANK YOU for this. Its my favorite show featuring my favorite era in fashion, design and all. 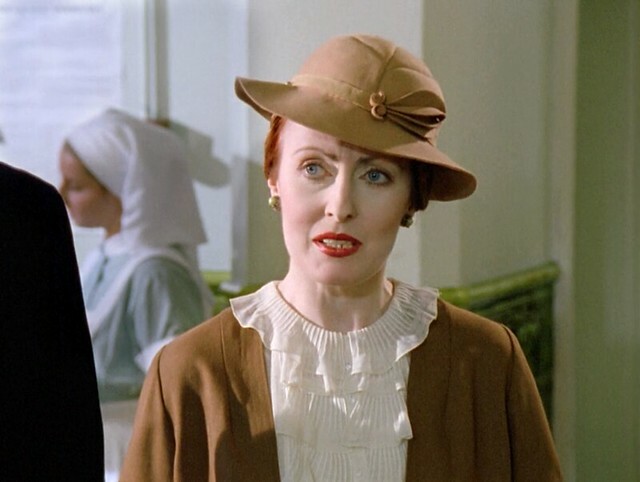 I've read all the books and prefer Miss Marple, but having run out of Marple DVDs from the library I switched over to Poirot and love the shows, but mainly for the divine Miss Lemon. I love her clothes, but I love her unexpected sense of humor even more. Thank you for putting the screen shots up! I'm also rather taken with Hastings. "You swine!" How I wish men talked like that now! I'm with Coffee Addict, no Miss Lemon or Hastings. What did they drive away in a Citroen? Back again , forgotten C.I.Japp. Many of the questions here can be explained if you know the stories as written by Agatha Christie. 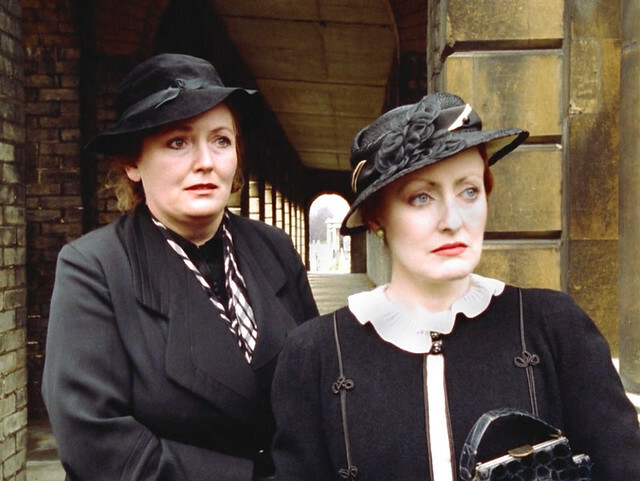 The earlier episodes of the David Suchet Poirot series must have had the Miss Lemon, Captain Hastings and Inspector Japp characters under contract and they had to be fitted into the movies, even if they weren't there in Christie's stories. That's why they suddenly disappeared when Suchet took over having more to say about it - the later movies are closer to the Christie writing. I am an avid re-reader of Christie and am currently reading the Poirot stories in chronological order. Knowing the stories like that I see the huge discrepancies in the movies - which, by the way, I also love. I just take them for what they are, though - no point trying to make them fit together or coincide with the books because they just don't!